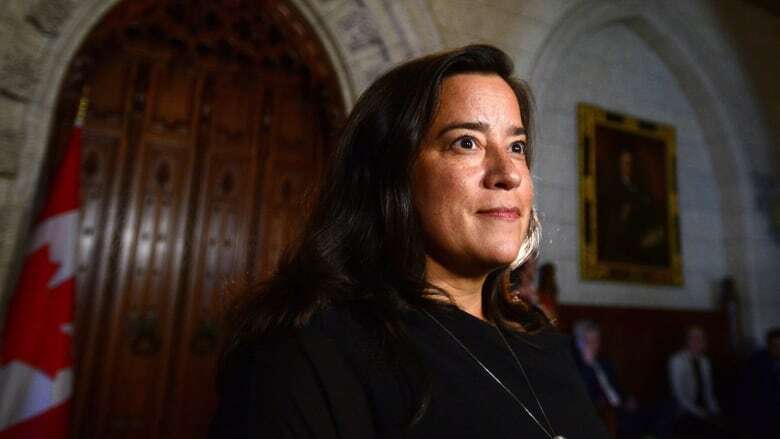 Former justice minister and attorney general Jody Wilson-Raybould will be called to testify before a parliamentary committee probing the SNC-Lavalin scandal — but opposition critics are furious that no past or current aides in the prime minister's office will be invited to appear. After a two-hour closed door meeting, members of the justice committee emerged today with a list of witnesses that includes a handful of academics and Justice Minister David Lametti, in addition to Wilson-Raybould. But Conservatives and New Democrats accused the Liberals of blocking key players from appearing — among them Gerry Butts, who suddenly resigned Monday from his position as Prime Minister Justin Trudeau's top adviser. Wilson-Raybould was demoted from minister of Justice to the Veterans Affairs portfolio earlier this month. She resigned cabinet last week, just days after the Globe and Mail reported that she was pressured by people in the Trudeau PMO to direct the Public Prosecution Service of Canada to draft a deferred prosecution agreement (DPA) — a legal tool resembling a plea deal — for SNC-Lavalin, allowing the global engineering firm to avoid criminal prosecution on bribery and fraud charges in relation to contracts in Libya. Wilson-Raybould surprised many today when she emerged from the cabinet room in the afternoon after addressing Trudeau and his ministers. Standing at the centre of a scandal engulfing the government — and asserting that she still remains bound by solicitor-client privilege that limits what she can say publicly — she said the situation is complex. "The rules and laws around privilege, around confidentiality, around my responsibility as a member of Parliament, my ethical and professional responsibilities as a lawyer, are layered and incredibly complicated. So I'm still working with my lawyer," she said. As the former attorney-general, Wilson-Raybould acted as the government's top lawyer. Conservative deputy leader Lisa Raitt expressed deep disappointment with the committee's witness list and said that committee members must hear from Butts in order to get to the bottom of the affair. "We will ask very good questions and we will expect the witnesses to answer truthfully because they will be under oath," she said. Raitt said it's also critical that Trudeau waive client-solicitor privilege for Wilson-Raybould so she can answer the committee's questions thoroughly. Trudeau said Wilson-Raybould made the request to address cabinet today, but would not divulge any details of what she said. Wilson-Raybould said today she remains a Liberal MP. She also said her lawyer, retired Supreme Court justice Thomas Cromwell, is advising her on what she can and can't say before the committee. "I will appear, but as I said, I'm still in discussions with my counsel about the various privileges and confidences that I have," she said. I have given notice of motion at the justice committee to invite the Hon. Jody Wilson-Raybould to appear before the committee. Minutes after that statement, Liberal MP Iqra Khalid‏ tweeted that she had issued a notice of motion before the justice committee to invite Wilson-Raybould to appear before the committee looking into the SNC-Lavalin controversy. Facing mounting pressure from opposition critics to waive client-solicitor privilege, Trudeau today would say only that he asked Lametti to review the situation and provide him with advice. NDP MP Murray Rankin said he was frustrated by the fact that no one from the PMO was on the witness list. "The justice committee owes it to Canadians to study this. It's fundamental to our democracy and, frankly, what happened there was a travesty," he said. Trudeau has denied any wrongdoing, as did Butts in his bombshell resignation letter Monday. Asked today if she was pressured by the Prime Minister's Office, Wilson-Raybould said she is "still working with my lawyer." ​Liberal MP Randy Boissonnault insisted the committee hearings will yield answers. "Canadians expect us to treat this matter seriously and fairly and to act with integrity," he said. "That is what we are doing."